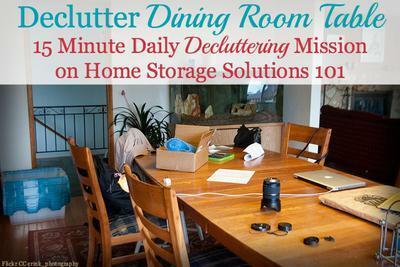 Today's decluttering mission is to declutter and clear off your dining room table. 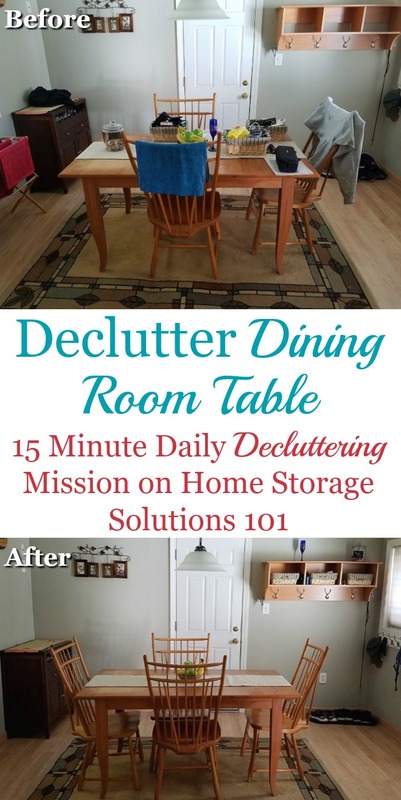 This mission is designed to be done while working on the Organizing Dining Room Challenge here on the site, as part of the 52 Week Organized Home Challenge. Of course, it can be done any time you need it, and realistically, it will need to be done more frequently than once a year. Depending on how much you use your dining room table, it may need to be done daily! The idea in this mission is to clear off the clutter, as well as to begin to develop the habits necessary to keep the surface clear most of the time from now on, so any future decluttering sessions wouldn't take very long at all. Your dining room table is a flat surface and so it has a tendency to get covered with things we just lay down, or projects we or a family member are working on. 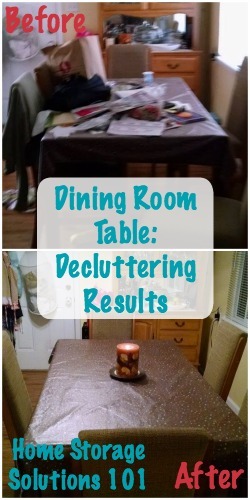 These things also tend to linger because if you've got both a dining room table and kitchen table (I know not everyone does) you don't have to eat at your dining room table frequently, which means there isn't much of an incentive sometimes to clear it off. But today's the day! Put away what doesn't belong and make the surface at least mostly clear. 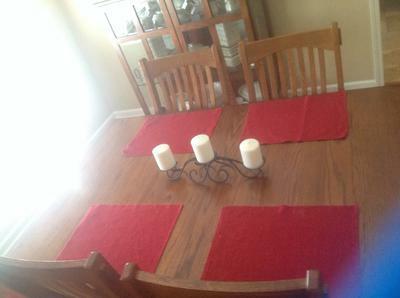 If you don't have a dining room table just do the same thing for your kitchen table. Ready, set, go! This can make such a dramatic difference in the overall look of the room, so I'd love to see pictures from anyone who does today's mission (either before or after pics, or both). Also, if you've already got a clear table, awesome, I'd love to see it too! Let's cheer each other on with this mission! Below are pictures of these tables that readers have sent in, some of them decluttered and others that still need a bit of work, all for inspiration for you! 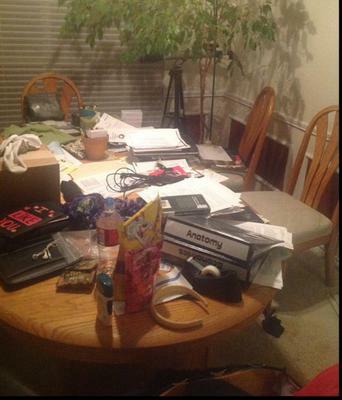 Portia sent in this picture of the way her dining room table looks, right now. 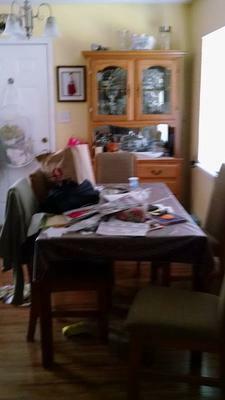 She said, sarcastically, "I can't imagine someone thinking clutter is a problem. :( "
I get that Portia, I really do! It can seem really overwhelming to get and keep this flat surface cleared off. The thing is, it really doesn't take as long as you might imagine. Scroll down to see some examples of how readers cleared off this surface quickly, and what a visual impact it made to hopefully get you inspired! Shannon sent in these two photos, the first is the before, and the second is the after. She explained that it only took her 10 minutes to accomplish this! How awesome is that? Does All The Clutter On Your Table Actually Have A Home Somewhere Else? Jennifer sent in this photo, and said, "My before and after. Now to deal with all the squash!" She makes a good point. The idea when doing this mission is to actually deal with the clutter that has accumulated on your table, not just shift it somewhere else. Otherwise you won't actually be accomplishing much, in the long run. See what types of items you've got on your table and if they have a home, put them there. Easy peasy. However, if you begin to find while decluttering that some of the items you've got on the table don't have a home you may have identified a key reason that your table is getting cluttered in the first place. Nobody knows where else to put it! So, to maintain a clear table most of the time you will need to eventually find homes for all the items that, over and over, seem to accumulate on your table. Not necessarily fun, but it will often fix the root cause of your problem if you do this. 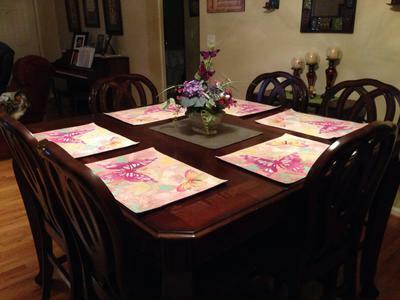 Donna said, "I keep my table decorated with a flower arrangement and placemats. I think that helps because it is not seen as a place to 'dump things.' It's a pretty space and I want to keep it that way." I think that can be a good strategy Donna. Completely flat surfaces just call to people to lay things down on them, but putting something pretty there can discourage that. On the other hand, be careful with this strategy because you don't want your decorative items to themselves become clutter. It's a fine line, but it definitely is a strategy that can work for some people! Sometimes You Need A Little Outside Push But Why? 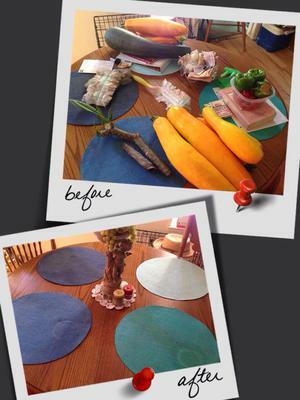 Amanda provided these before and after pictures of her dining room table. Like many of us she needed a bit of an outside push, with relatives visiting, to finally get it done. In fact, she'd let it linger for about two weeks she guessed all cluttered up before clearing it off. The thing is, since it doesn't take that long, why do we wait for our homes to look good for others? Let's try to treat our own immediate family just as nicely, and do it so not only guests can enjoy the flat surface but so we can too! Dianna sent in this picture, and all she said was, "We did it!" I'm so proud of you Dianna, it looks absolutely wonderful. And I hope seeing these photos has made you realize you can do it too! 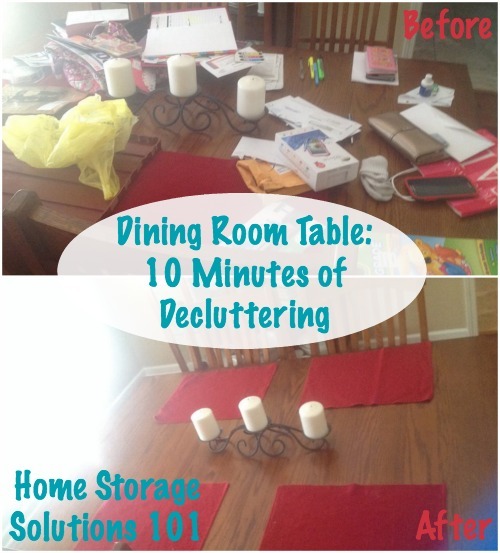 I hope seeing these pictures has inspired you to declutter your dining room table. Comments for We Did It! And So Can You! Take advantage of city-wide annual cleanup days. Some have hazardous waste collections, paint, chemicals. Old tires, used car oil. During these events disposal is FREE or at a reduced fee. The old and broken furniture sitting outside can be removed too. Some charitable organizations take junk cars. Your curb appeal will improve drastically! "A place for everything, and everything in its place." The saying I've heard all my life. It's true, everything needs to have a "home". If it doesn't, we don't need it. I struggle every day with this. I have a donate box and I put things in it all the time and quickly remove it out of the house. Luckily, my town has 6 resale shops (non-profit hospice, church, Goodwill, Salvation Army, Habitat Restore and another non-profit charitable store.) So, it's easy to get stuff out. It is satisfying to see results. If you have projects/crafts, finish them or pass them on because they take up a lot of space. AND I give you PERMISSION to get rid of them! I am new here and I want to know if there is a general decluttering guide available. You say to declutter, but you don't say how. And, how to get yourself started. Please let me know what I am missing. Thanks. Hi Barbara! Welcome to the site, and glad you're getting going with your decluttering efforts. I actually do have a whole section of the site which provides a general guide to decluttering. Here's the decluttering tips series which has lots of articles which I hope can help, discussing both the emotional aspects of clutter and the fundamental how to's as well. 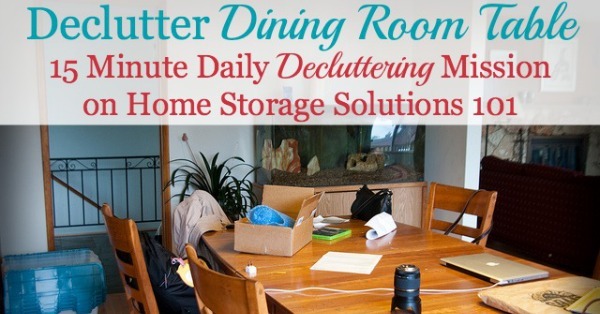 When you get down to the nitty gritty of decluttering here's the how to declutter article. Hope that helps! 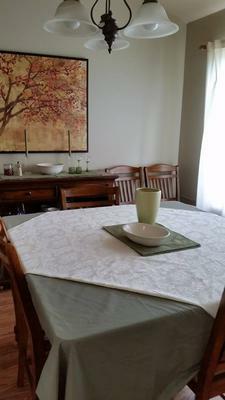 There is a "new" thing I've noticed when visiting homes that are clutter-free, the dining room table is beautifully and completely set for the next meal. I thought they were just trying to make their house look like it came from a magazine. However, now I'm thinking this would be a wonderful way to save time (putting away, getting out service ware) and to discourage dumping on the table. I like to read, study, take notes, I constantly have a stack of materials that I don't know what to do with when I'm not using them so they are continually being shifted from one flat surface to another, usually kitchen or dining room table. Does anyone have a solution idea? I got a study desk but it is in our loft and not a convenient place to keep taking books to when I'm studying/reading down stairs. What to do with hubby's stuff? I agree 100% -- any empty vertical surface must have a sign floating above that reads "put it here - I don't care!" I've tried the suggestion of putting something "nice" on the table to keep it clutter free. But my darling hubby - whom I love to pieces and wouldn't trade him for anything --doesn't necessarily abide by this rule - he'll either move "the nice things" to the side or use the placemat as a place to put his stuff to keep it all in one place! So any other suggestions? And yes I've tried to nicely "hint" that we shouldn't do that - so I guess I'll just have to continue picking it up and hope I find a true happy home for his stuff! Thanks for the encouragement! I am new to this site and I need a lot of help. I am dyslexic and one of the issues I have is layering and clutter. I have just started teaching and I am also starting a home business. So I have been making my workshop, now I need to organise it. My lesson plans need organising and activities including craft. I feel over whelmed as I am a carer for my family including my disabled son, mother in law and husband with injuries. I do the house work, gardening, work, pets, cooking, DIY etc. I struggle to order things always have! If I have a surface it will have something on it in a minute. I realise now I need to be more organised or I will not manage my time. I simply cannot go on like this! This is serious for me! I am getting older now and I have not got unlimited energy! That's a great idea, I did that. I had my table completely clutter free! I got organizers for my husbands mail! I put a table cloth, centerpiece on the table it looked lovely! That lasted about one day! He is hopeless, he still put clutter on the table. He throws the mail down, doesn't go through it, in fact I've missed monthly payments because I didn't see the bill! I even brought a desk down in the kitchen for his paperwork! Nothing works! My table is constantly cluttered no matter how hard I try! He puts his hats on there, his lunch pail, t-shirts (new for work), he is like this throughout the entire house! He throws his dirty clothes on the floor next to the clothes hamper! I am constantly going behind him, I ask him to do it, he doesn't I'm exhausted! So sometimes there's just no organizing! Not while he is around! This is for the lady who says she is dyslexic, and is starting a business. Give every room its own box, kept in a spare area. Also have a 'gathering' basket, used to gather 'stuff' from all areas. Sort into boxes and put away asap. As a teacher, you also need a 'teaching area' that for the purpose of tidying, you treat as a room. I like all of the decluttering ideas on Pinterest. 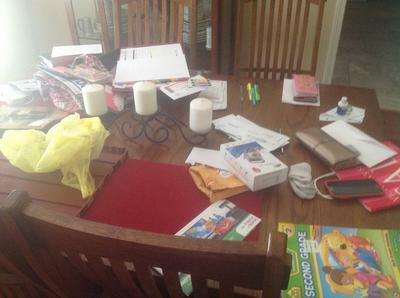 I have clutter on my dining room table. I would like to clear it to make it neat, however, I don't have space for a desk as I am in a small condo(1100sq ft). What suggestions can you give. I try so hard to keep my DR table clear, but it is the first room you walk into besides the entry. My hubby seems to have taken it over as an office and it’s constantly covered with paperwork and projects. I have tried taking to him about it. I even put a small desk and file cabinet in the entryway, to no avail. He says if the stuff isn’t out where he can see it, he’ll forget about it. Any suggestions? Years and years ago I got tired of the dining room table being a drop zone. I went out and bought a very cheap (but nice looking) lace overlay for the table. That was the style at the time. I never told anyone how cheap it was. However that overlay did the trick. Before no one would think twice about putting something on the table. Afterwards the items found their way to where they belonged or at least in that direction. My husband wasn't about to ruin an expensive overlay and made sure no one else would either. Giggle giggle. We are all able to clear that table, but the real trick is to find a real home for all the clutter. If it's thrown away, that's great! What if you need to create new spaces? I live in a small home. I think I need a PURGE! !